THE FIVE QUESTION SERIES WITH DR. SLOANE - SELECT-CARE CHIROPRACTIC, P.C. The Five Question Series is a new monthly Q&A highlighting women in Saratoga County committed to natural and/or sustainable living. 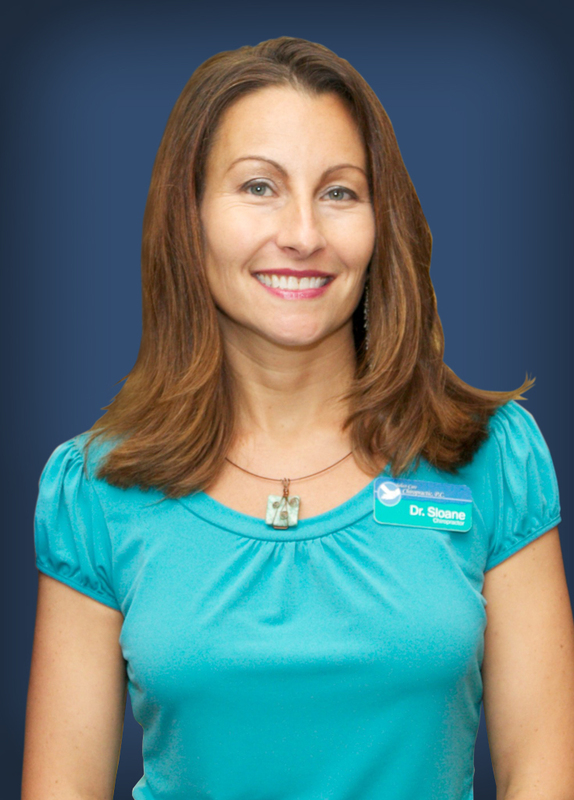 I’m happy to feature Dr. Sloane DeLuke Eusebio of Select Care Chiropractic, P.C. as the first guest in this series. I met Dr. Sloane during my first pregnancy. Although I had a healthy pregnancy, I suffered from a mean case of sciatica that made walking and even sitting extremely painful and difficult. Dr. Sloane got me through that and later, saw my son for adjustments when he was just a few weeks old. She continued treating him throughout his first few months as we coped with an insufferable case of colic. Dr. Sloane was not only helpful with alleviating our symptoms, but she and her compassionate staff offered such positive emotional and physical support to me during that vulnerable fourth trimester that seven years later, we remain friends. 1. What inspired you to be a chiropractor? I loved the idea of promoting real health, not treating disease. The idea of holistic health care, of healing the body naturally, the idea of getting to the root of the problem to create true healing and optimal function in a body, THIS is what inspired me. This is health care. Traditional medical care, while fantastic in an emergency to save lives in the short term, really does not address the CAUSE of the emergency and certainly does not address prevention. It is SICKNESS care, not WELLNESS care. Chiropractic is about wellness, about getting the very most out of the body and brain that they can! 2. What makes your practice unique? From the first phone call, to the receptionist at the front desk, to the doctors, we are customer service oriented. We know our patients and care about their lives. The doctors are thorough, caring, professional, gentle, effective, and treat each patient as an individual. We do not do cookie cutter care, and we spend time with people. Our time and treatment modalities may not even be reimbursable by insurance, but we do what we feel is necessary to provide optimum care. We also take the time to explain what we are doing, what we are recommending, and WHY. We feel that patients deserve to know as much as they can about their bodies and how they function. We also co-treat with other health care professionals as needed, and help patients to identify areas where they can make changes at home to achieve better and longer lasting results. 3. Can you discuss some challenges that you face in running a natural, holistic practice? First let me say that I think that in the current insurance climate, most everyone in healthcare who accepts insurance faces some unpleasant challenges in terms of care limitations and fees that are not in accordance with the effort and time we spend. In addition to that challenge, being the owner of a natural, holistic practice can be frustrating in terms of having difficulty getting the respect and credibility we deserve. It can also be hard to get the message of true wellness care out to people, since they are often strongly anchored to the idea of sickness care and medications and surgeries as the only “real” treatment options. There is a tremendous lobby with political and financial power that does not want people to take their health into their own hands and does not want them to use diet, exercise, nutrition, yoga, meditation, acupuncture, massage, energy work, and chiropractic to really heal themselves. Yet, this is the only real way to attain true health. In chiropractic, we have a fantastic product that is GOOD for people, is affordable, and is much safer than medications and surgeries, and we are still running up against the medical and pharmaceutical lobby. We are not seen as “real” doctors. That is frustrating, because we are just different doctors. We both have a role in the lives of most people, and that message is still hard to deliver at times. People often think it is one or the other, when in fact, the combined care of traditional and holistic medicine is where I would like to see the focus be. 4. Is it intentional that your practice is entirely staffed by women? Not intentional at all, but it has just sort of evolved that way. It does impact the energy, or VIBE of the practice in terms of our pace and approach, but certainly not in terms of the patients we serve (we welcome boys and men). I am open to hiring a male doctor or receptionist if they have the type of energy that fits in with us. Often, male energy is more intense and fast paced, and that is not really the direction I want my business to go in, be it with a woman or a man. 5. How does Chiropractic care benefit young children? I have been adjusting my son since he was a couple of days old, and continue to do so at least once a month (he is 5 now). I do this because a spine and nervous system with spinal subluxation simply cannot thrive, especially not in a growing, developing child. On top of that, regular chiropractic care can help prevent colic, ear infections, constipation, growing pains, illness, injury, and even behavioral issues. A nervous system out of balance leads to a body out of balance, which leads to trips to the medical doctor, which leads to medications and surgeries, but still does not lead to a nervous system in balance, so the cycle continues. Chiropractic care and adjustments from infancy, combined with an holistic pregnancy and birth is instrumental to a child’s mental and physical well-being and development. I also like to suggest limited screen time, some basic nutritional advice, delayed introductions of grains and dairy before one year of age, whole food vitamins, probiotics, omega-three fatty acids, Vitamin D3, and a few other immune boosting supplements to complete the picture of optimal health and function in infants and children.